For the past 9 years Thailand has hosted an amazing series of international chess tournaments, featuring players of all levels from juniors to grandmasters from over 50 countries around the world, including renowned players such as GM Nigel Short and GM Ian Rogers. This year is the 10th anniversary of Bangkok Chess Club’s cooperation with the Thailand Chess Association and, with sponsorship from the Tourism Authority of Thailand, the tournament is promising to be the best yet. 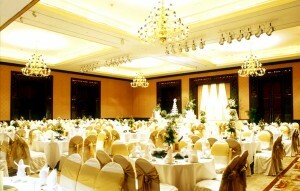 The venue is the Grand Ballroom in the luxurious Century Park Hotel, Bangkok, and the tournament will take place during Thailand’s Songkran holidays, 14-20 April 2010. Special room rates at the hotel have been negotiated, so it is a great reason to come to one of the world’s most popular tourist destinations, famous for its friendly people and delicious cuisine. We invite you to join us in celebrating our 10th anniversary at the 10th Thailand Open Chess Championship 2010. Download the latest list of registered participants here (XLS format). 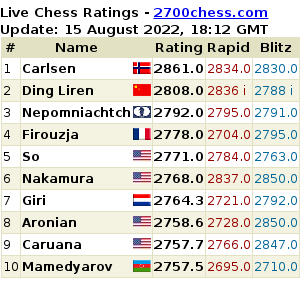 There are two groups of play: Open category for all players, and Challenger category restricted to players rated below 2100 or unrated (ratings based on FIDE or Thai ELO ratings – other national ratings will be validated by the organizer). When registering, players must indicate in which group they wish to play. Arbiters. Chief Arbiter IA Markku Kosonen (Finland), Deputy Chief Arbiter IA Panupand Vijjuprabha. If booked for minimum 7 night the hotel offers 2 complimentary dinners or lunches for single room, and 4 dinners or lunches for twin room, served at Roberto Italian restaurant or international buffet at Café at the Park. For accommodation reservations at the venue, Century Park Hotel Bangkok, please contact Ms. Pharanya (pharanya@centuryparkhotel.com). Open: 2,500 Baht (For Thai nationals and TCA members 1,200 Baht). Late registration fee after March 10, 2010 is 500 Baht. Challenger: 1,000 Baht. Late registration fee after March 10, 2010 is 500 Baht. (US$ 1 is approx. 33 Baht, 1 Euro is approx. 49 Baht). All tournament fees must be paid before the start of the first round. Registration. The deadline for registration is March 10, 2010. After this a late registration charge of 500 Baht will be added. Organizers reserve the right to refuse or decline late registrations. Conditions for Titled Players. Tournament fees are waived for GMs, WGMs, IMs, WIMs and 2500+ rated players (according official FIDE January 2010 rating list). First 15 GMs to register will get complimentary accommodation (room & breakfast in twin sharing with another GM for 7 nights). Complimentary room reservation is confirmed after receiving deposit transfer of Euro 50. This received deposit will be fully returned after check-in to hotel. Please contact organizer (bangkokchess@gmail.com) for inquiries.